I attended my first city council meeting as an Oakland resident last night (December 9th). It was a session of farewells, discussion of nonviolent direct action, a 1,000-person demonstration, an accusation of illegality, and a hard-won victory for circus elephants. It was also the longest meeting I had ever attended, breaking my previous record of five hours (with a break) and still in session when I left roughly seven hours after it started at 5:30pm. The session began with something of an Oakland Government Oscar Night. This turned out to be both soon-to-be-former Mayor Jean Quan’s and Council President Patricia Kernighan’s last meeting, while retiring Director of Emergency Services and Homeland Security at Oakland Fire Department Renee Domingo was honored for her twenty-five years of service to the City of Oakland. Volunteer leaders of Council District 2, including Oakland Chinatown Chamber of Commerce Foundation President and unofficial “Mayor of Chinatown” Carl Chan, were also recognized. Left to right: Mayor Jean Quan, City Council President Patricia Kernighan, Director of Emergency Services and Homeland Security Renee Domingo, and unofficial Mayor of Chinatown Carl Chan. Finally, it was time to address the issues. The first item was the Ferguson Resolution, a motion “Calling for Changes to be Filed and Recognizing Our Collective Responsibility to Advance Racial Equity.” Councilwoman Desley Brooks did not mince words on the subject: “Racism is alive and well in Oakland.” She spoke brilliantly on the importance of nonviolent direct action, and reminded us that the work of Dr. Martin Luther King and others is far from over. Sometimes civil disobedience is uncomfortable, and sometimes it is inconvenient; but it is still NECESSARY. While the passage of this resolution was critical, it was far less controversial than the bullhook debate that would follow hours later. Almost all of the fifteen citizens who spoke prior to the vote spoke in favor of the resolution, with only one citizen stating his objection on the grounds that so many black people have been killed right here in Oakland without the parties responsible being held accountable in any way that any resolution passed by our city council should include them as well—not just the Michael Brown case. This battle was swiftly and unsurprisingly won; but there is still a long way to go with respect to rebuilding trust between the police and the community, as events unfolding later in the evening would demonstrate. Bullhooks are used not only to inflict pain upon elephants but also to instill fear. Circus-raised elephants are taught as babies that the bullhook means pain. Never forgetting this early trauma, elephants are controlled during training sessions via use of the bullhook and on stage via fear of it. Some testified last night that handlers keep bullhooks up their sleeves during performances, hidden from the public but in view of the elephant— a constant reminder of the consequences of disobedience. Initially, the bullhook ban was the first non-consent item on the meeting’s agenda. The items were quickly reordered, however, after it was determined that an overwhelming 110 people had signed up to speak their piece about the bullhook ban. Discussion of the bullhook ban was delayed until roughly 10pm. Right from the start, it was evident that this was not to be a traditional meeting. Citizens who have signed up to do so are typically given roughly one minute each to speak at city council meetings. At last night's meeting, the discussion of bullhooks instead began with a formal ten-minute presentation by those in favor of the ban—which had been approved prior to the session by Councilman Noel Gallo, one of the two who brought the issue to the fore (the other being Councilman Dan Kalb); but of which no one thought to request the prior approval of President Kernighan. In her momentary absence from the chamber, a video began, showing Ringling Brothers employees abusing elephants with bullhooks in 2009. Needless to say, Madam President was not pleased. 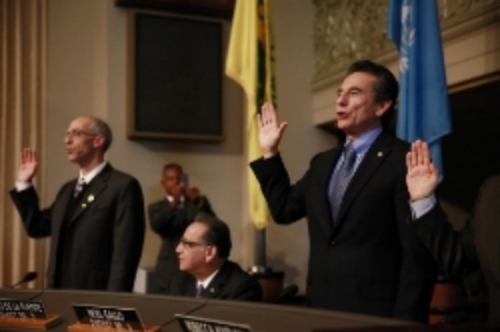 Councilman Kalb (left) and Councilman Gallo (right), being sworn in. Roughly an hour into the discussion, it was announced that a group of protesters estimated at about 1,000 were gathered on the steps of City Hall, demonstrating against the Michael Brown and Eric Garner decisions. Council members debated as to whether or not to shut down the meeting; while Councilman Larry Reid maintained that there were public safety issues to consider, and that the protesters should not be allowed into council chambers as to do so would create a fire hazard, Councilwomen Brooks and Lynette McElhaney insisted that not only should the session continue but that it was the council’s sworn duty to admit all citizens to the public meeting. The doors were then unlocked—at least at the side entrance. The meeting continued. Predictably, several concerned citizens spoke about the threat this ban posed to their jobs—seemingly unaware that it was neither City Council nor the citizens of Oakland but rather Feld Entertainment, Ringling Brothers’s parent company, who threatened their jobs (and, consequential, their access to health care). The ban, mind you, had nothing whatsoever to do with banning circuses from Oakland or even banning the use of elephants in circuses in Oakland; it simply sought to ban the use of an abusive, dangerous instrument in the training of elephants. Councilman Kalb was compelled to remind the chamber of this fact after testimony from the opposition repeatedly framed the argument as one of “humans vs. animals,” implying that job losses would immediately and inevitably result from the bullhook ban and that, consequently, anyone voting in favor of the elephants tonight would inherently be voting against humanity. Sensing that the situation was about to get bloody, Councilwoman Rebecca Kaplan—who had charmingly announced at the start of the meeting that she was wearing a sports cap in celebration of the Warriors’ recent victory over the Lakers—proposed a compromise: following the lead of Los Angeles and other cities, she proposed that the ban be passed but that it not go into effect until September 2017. The compromise replaced the original motion to institute a ban effective immediately. Elephant trainers on both sides of the debate spoke, some insisting on calling the bullhook a “guide” and claiming that they used it regularly and humanely, while others revealed that they had been training elephants for over a decade without the use of bullhooks. Feld Entertainment’s threat to stop bringing circuses and other shows under its umbrella, such as Disney on Ice, to Oakland was the company’s way of bullying City Council in the same way that it bullies elephants—implying that there is no choice in the matter, and that if it doesn’t get what it wants, anyone standing in the way will suffer. The numbers bandied about surrounding the issue were equally absurd. Everything from $200,000 to $700,000 to $1.4 million was cited as possible losses to our city without Feld’s patronage; yet not one of the three people who spat out these numbers was able to explain concretely how they had arrived as such a number. One woman, who supported the $700,000 estimate, said she came to this conclusion by considering that some people who go to circuses might stay at Oakland’s hotels or use Oakland’s gas stations. When was the last time anyone you know took a trip to a city in which they knew no one, and therefore were obligated to stay in a hotel, just to see the circus? Or filled a car with gas strictly for that purpose? Honestly, I am certain that the day will soon come when we will see a ban on elephants being used in circuses altogether; but we made some moves tonight, and with this ban we will keep moving forward. Here we arrive at the heart of the matter—total animal liberation. Coming on the heels of my December 5, 2014 article, “Low-Hanging Fruit,” the timing of her words could not have been better for me. While banning circuses was not the issue of the evening, it was evident that many of the Oakland residents present would support such a ban; but there needs to be a starting point, a nexus. Oakland has now joined Los Angeles and other cities in adopting a bullhook ban; it is my sincere hope that soon, Oakland will join Mexico City, Bolivia, Peru, Greece, and the many others who have banned the use of wild animals in circuses altogether. The next city council meeting, at which the proposed ban will be finalized, with take place January 6, 2015. I strongly encourage liberationist Oakland residents to attend.